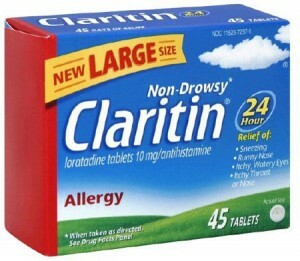 Most individuals do not experience Claritin side effects when they take the medication as directed. While it is a safe medication that is sold over the counter, patients should be aware of all of the possible side effects they may experience during treatment, including dry mouth, drowsiness, jaundice or seizures. Loratidine is considered to be a non-sedating antihistamine, but may still cause drowsiness in some individuals. Be sure you know how Claritin will affect you before driving or operating machinery. While these side effects are mild and do not occur extremely frequently, they should be reported to a physician if they persist or become increasingly bothersome. Most of these side effects will resolve on their own during treatment. If an allergic reaction is suspected, patients should call 911 or contact an ambulance for help. Children with allergies, as well as cold and flu symptoms, can often get relief from Loratadine. The manufacturer has created oral suspensions and chewable tablets with children in mind, but caregivers should exercise great caution in making sure that they are providing the correct dosage. Claritin is approved in children ages two and older by the FDA, though it can be prescribed to younger children if the need exists. Children aged two to five can take up to 5mg of Claritin per day; children over the age of five through adulthood are generally administered 10mg per day. This dosage should never be exceeded except under the direct supervision of a doctor. Most children do not experience any adverse side effects of Claritin, but a small number may suffer from the symptoms below. If any of these conditions persist or become severe, contact your child’s doctor. Elderly patients who suffer from seasonal allergies, hay fever and respiratory symptoms of the flu and common cold can also get adequate relief from Loratadine. No dosage adjustments are needed based upon the age of the patient as long as the patient is over the age of five. Elderly patients may experience the more common side effects of Claritin more often than other age groups, however, and should be closely monitored for serious side effects like seizures and jaundice. Elderly patients, like adults and children ages five and over, should take a dosage of 10mg of Claritin per day unless otherwise instructed by a physician. These Claritin side effects are typically mild. If they are severe or don’t subside, contact your doctor. Changes in behavior, abnormal thoughts, a fast or irregular heartbeat, tremors, or any other unusual symptoms should be reported to a professional immediately. Although these are very rare, patients who experience them after taking Loratadine are encouraged to contact the FDA with information as well as their physicians. A decision will be made whether to continue to take the medication in lieu of the symptoms. With very few side effects and the convenience of being purchased without a prescription, Claritin is used by millions of allergy sufferers for reliable relief that doesn’t interfere with their daily activities. Claritin side effects are rare and generally mild, but it is still important to start this medication when you have the time to see how it may affect you. Don’t drive or perform tasks that require concentration or skill until you are sure of how you will react.